Parenting Many of today's children is basedon the intellectual formation. From an early age children are given various preschool and preparatory courses. Of course, all this is necessary, but not at the expense of physical development. The task of any parent - to make sure that the child grew up and was formed in all plans: both mentally and physically. 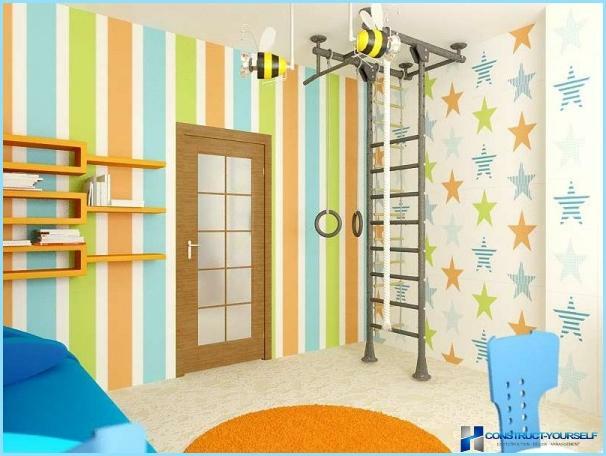 One of the important stages - a children's room, which should be equipped not only with all the tools for the study and rest, but also a sports area. 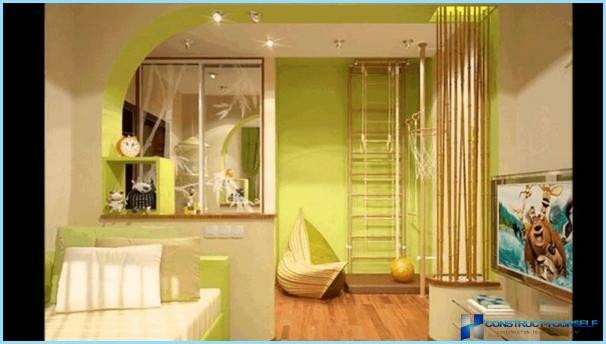 Under normal circumstances, when the apartments area small area of ​​the room, make it difficult, but still possible. 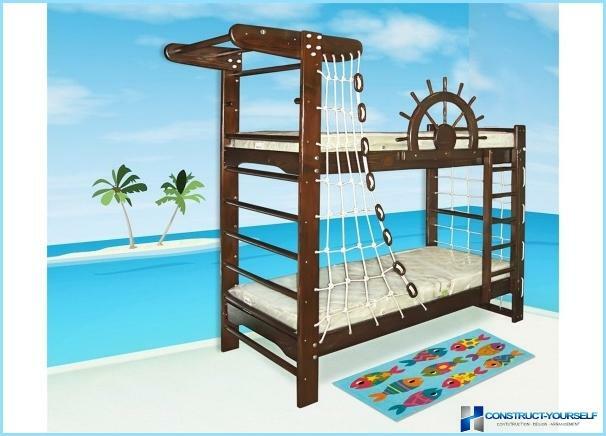 After all, modern designs are quite varied to meet the needs of the child in constant motion, as well as meet the wishes of the parents, both in pricing and in terms of accommodation. Before installing the corner, should be familiar with their views and range. The small room is best suited sports corner L-shaped. They freely attached to the wall and does not take up much space. However, such a construction would be less functional. If possible, choose the best sportArea U-shaped. 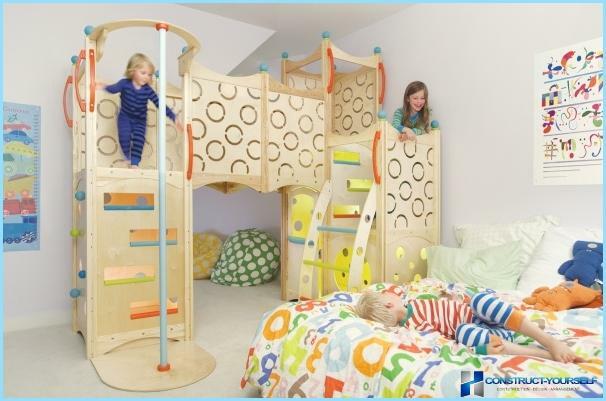 Despite the fact that the construction requires more space, it is more functional, which undoubtedly would benefit the child. In addition, it is equally important to all sportsdesign perfectly fit into the interior. In addition to the different color variations, you can also select and bracket material. The main are for the manufacture of wood and metal. The first embodiment is considered the best because it is made of natural material and has a composition of any additional impurities. However, the metal variant is more durable and able to withstand several children at the same time. In addition, the area has a variety of colors and different shapes. Wall bars - the basis of any corner. Complementing its various parts, the child may engage in any exercise. 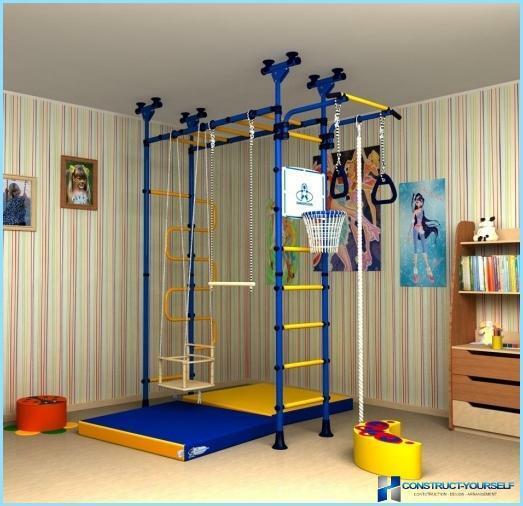 Gymnastic rings, horizontal ladder, horizontal bars are able not only to pass the time for the children of the fun game, but also to strengthen the muscles of the arms and abdomen. Swings are suitable even for the youngest. The main thing to purchase, take into account space. After all, even the smallest of their kind requires quite a lot of space. Ropes, rope ladders and nets apartimpact on all muscle groups, develop the child's willpower. After all, what would be his joy when, notwithstanding, many failed attempts, he finally gets to the top rope. Basketball hoop and ball provide love for the sport and develop motor skills and hand coordination. Also, the child will be happy to practice boxing skills on pear, introducing himself beloved hero who defeated the whole army of enemies. Mats. Taking care of the instruments, do not forget safety. Surely the child during the game will fall far more than once. To protect it from scratches and bruises, the floor must necessarily be paved with mattresses. 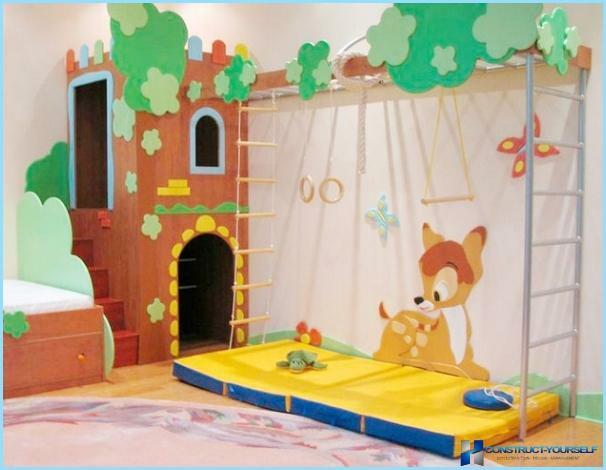 Area children's rooms, often does not exceed 10square meters. It seems that in that territory is not even all the major items can be set, not to mention the sports facility. However, even in this situation it may be the universal set area, and not one way. 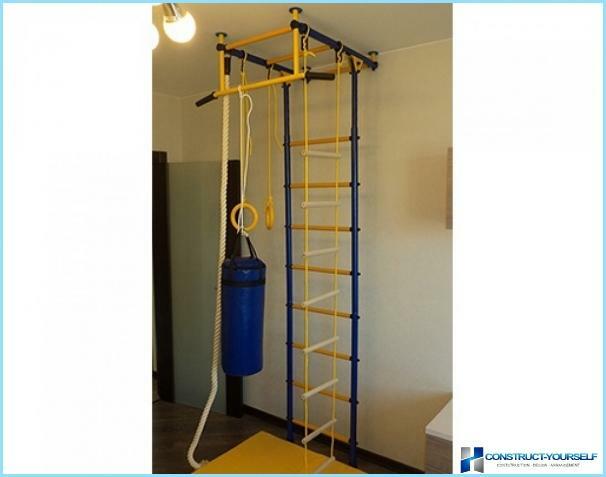 The first option is to mount a normalsport wall bars with horizontal bar to which you can also add a pear, a ring or a basketball hoop. This installation may take no more than one meter. And setting it in the corner of the room, it does not interfere with the movement and use of the other things in the room. 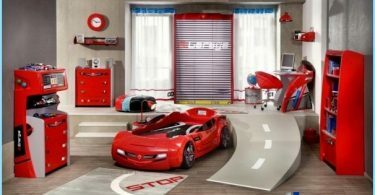 The second, more versatile and functionaloption equipment sport equipment small child's room is to use a combination of furniture. In this case, the furniture can simultaneously perform multiple functions. 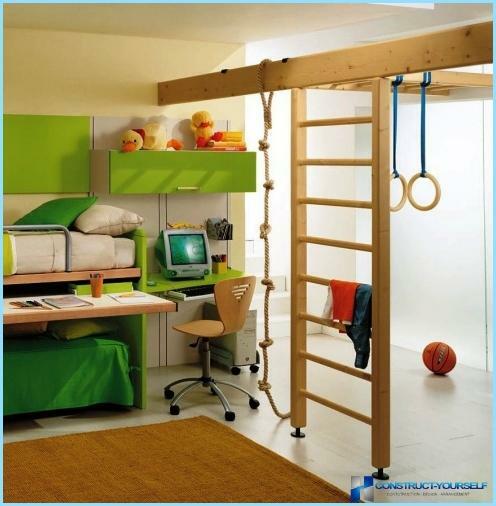 In it, in addition to components for sports activities includes a bed, a wardrobe, a table or a bedside table. Combined furniture fine saves. Besides, it can be matched to any design of the room. 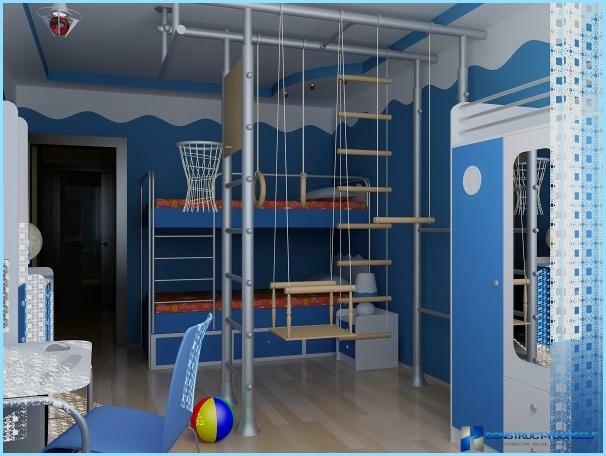 If the child has a large and spacious room,options and installation methods corners much more. In this case, you can put an entire sports system. 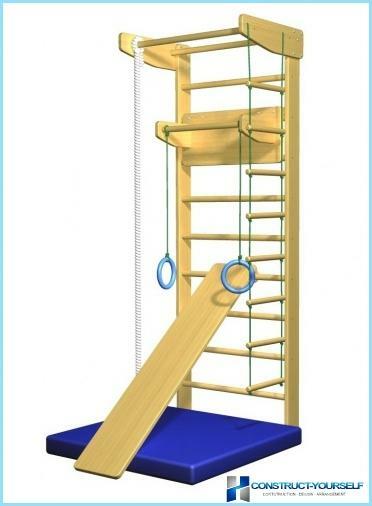 Usual wall bars can be added not only to the bar, but also horizontal ladders, various obstacles and other other equipment. 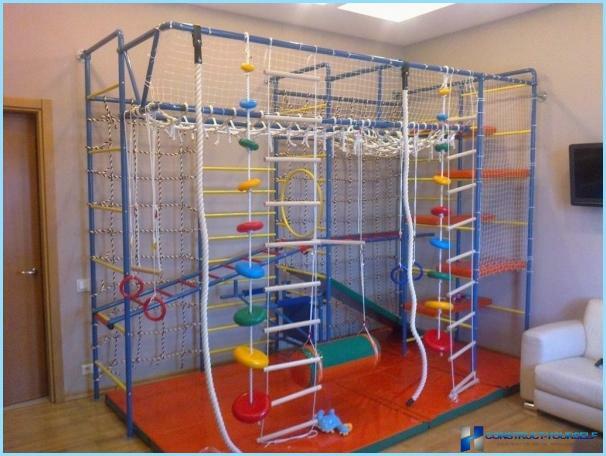 The price of this sport in the children's room installationwill be significantly higher than the previous versions. 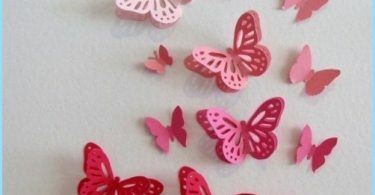 However, its presence will allow to have fun with friends, arrange a children's party in honor of a birthday or other celebration right at home. At the same time the children will never be bored. In addition, an abundance of sports equipment will be even more natalkivat child to exercise. By connecting the imagination, can be arranged in the areaa pirate ship or jungle. Accordingly, the room should be designed in a similar style. Such an environment requires a lot of hassle. But there is no doubt that the child's laughter and his enthusiastic eyes will pay all efforts. Having defined the material and dimensionssports corner, you can choose a color scheme. You can rely on the classic version. That is, for a boy selected area with different shades of blue, green, black. Girls will approach the red, yellow and other bright colors. If you need to choose for a boy and a girl, you can combine the colors to suit every taste. More important is not the color and quality of the coating. Over time, due to heavy use, the paint may peel or rub off. Given the high cost of construction, this factor is very unpleasant. Council! Some parents do refusepaint coating. Wooden sports corners simply treated with lacquer, and metal - a special solution which will protect the hardware from a variety of changes. Despite its simplicity, with the correct setting of the room, a corner will look no worse. 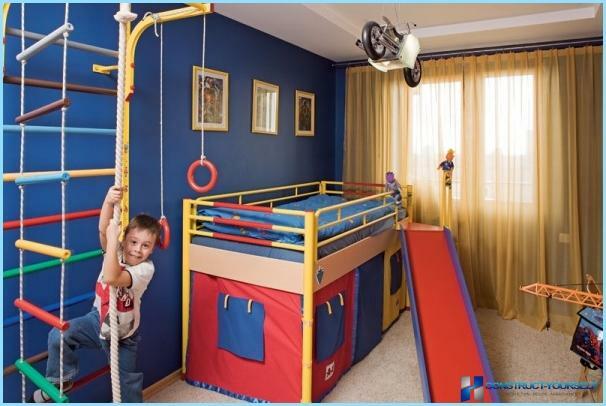 A skilled owner can build children's sports area and with his own hands. To do this, you first need to determine what components will be constructed. 2 timber with dimensions 5h14h300. The latter value can be changed depending on the height of the ceiling. 6 cuttings a shovel. Buy them can be in the hardware store. An important condition is that they did not have any knots and cracks. The surface must be perfectly smooth. Metal brackets and screws for wall mounting. After both beams will be tailored to theceiling height, should be treated with their plane and sandpaper until the surface is smooth. After that, each beam should make holes for the bar. Using the three-meter board, would be enough of 11-12 holes. Their diameter must match the cuttings, or the crossbar, or will not, or will scroll. Further divided in two cuttings are inserted inRealized holes and corners are mounted to the joists. Then the structure is placed against a wall. Thus, the marking is applied, which shows parts mounting space. Before installing the wall, all the rungs must be sealed with adhesive. Mount the wall structure can be after the drying of the cuttings. Swedish wall bracket for sport is ready. Complemented it horizontal bar, which can make or manually using two boards, screws and the bar, or buy in the store. 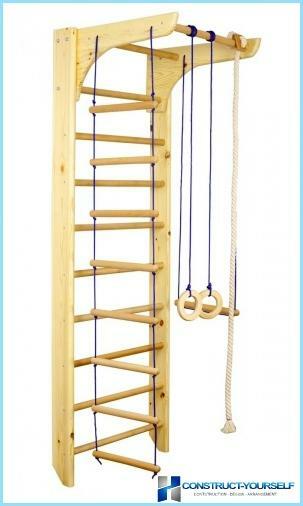 Gymnastic rings, you can also make your own, using the ring and rope. Other details (rope, rope ladder, etc.) can also be set independently. 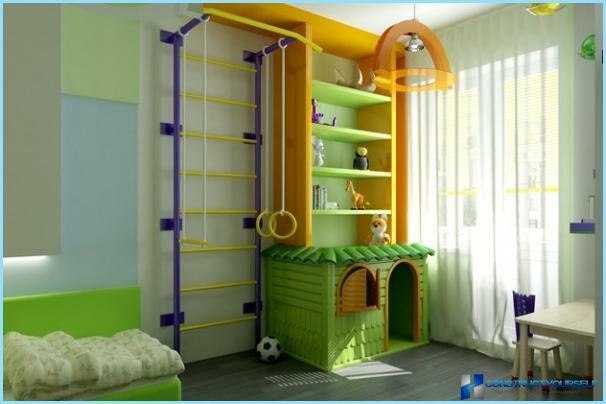 The basis of the children's sports corner for apartments, made with his own hands, should look something like the picture. Upon request, a sports area can be covered with varnish or paint.